My mother taught me an old/new trick. On really hot days like its been this summer you can make tea without boiling water. Because when its hot who wants to heat up their kitchen anyway. First get a jug or a jar. Something big enough to hold a lot of liquid, but with a closed lid so it won't evaporate. Thrift stores are always stocked with beverage dispensers and jars. Add your favorite tea, loose or bagged. I used peach blossom loose leaf from my local Co-op. If using bagged use about 4-8 depending the size of your container. 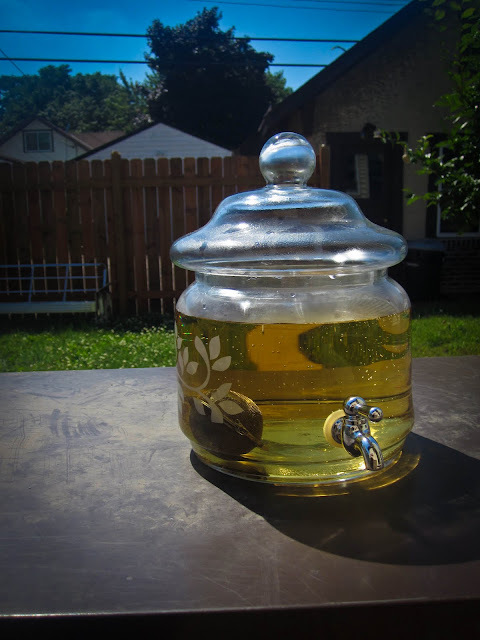 Fill container with cold water and set outside in a sunny spot for 3-4 hours. Mother nature will heat up your water for you and the tea will brew on its own. Bring inside and let sit to room temperature before putting in fridge or the liquid will become cloudy. I like to make it strong and then add ice cubes to cool it down quicker. Yes, we need to go golfing again. In September? I guess... I didn't go with Tyler's dad this weekend because there wasn't enough time (which you probably know since I didn't borrow your golf clubs). Mini golfing with fun the other day.